Happy Bloggers Challenge Friday! Thanks to those who played along with the Buttons and Bows Challenge. The challenge this week is Things with Wings. For my project, I created a Mixed Media card, using stamps from Prima and the Dylusions Line by Ranger Ink. To create the background panel, I applied DecoArt American Multi-Surface Satin Acrylic Paint in Poppy, Costal Waters and Orange to my Gelli Arts Plate, then added the Dots Stencil from Just a Trace and some Punchanella to the plate, and made a print onto Mixed Media Paper. The Julie Nutting Doll Stamp from Prima is stamped onto a piece of paper from the Aquarelle Tag Pad, then I stamped her again on a scrap of Bo Bunny pattern paper to paper piece her dress, shoes and bow. I sponged all pieces with Gathered Twigs Distress Ink, then adhered the doll to the background panel using dimensionals. The butterflies are die cut using an Sizzlet Die, the sentiment is stamped in Ranger Black Archival ink using a SAMJ. To embellish, I added a few Silver gems. So fun, Lisa! 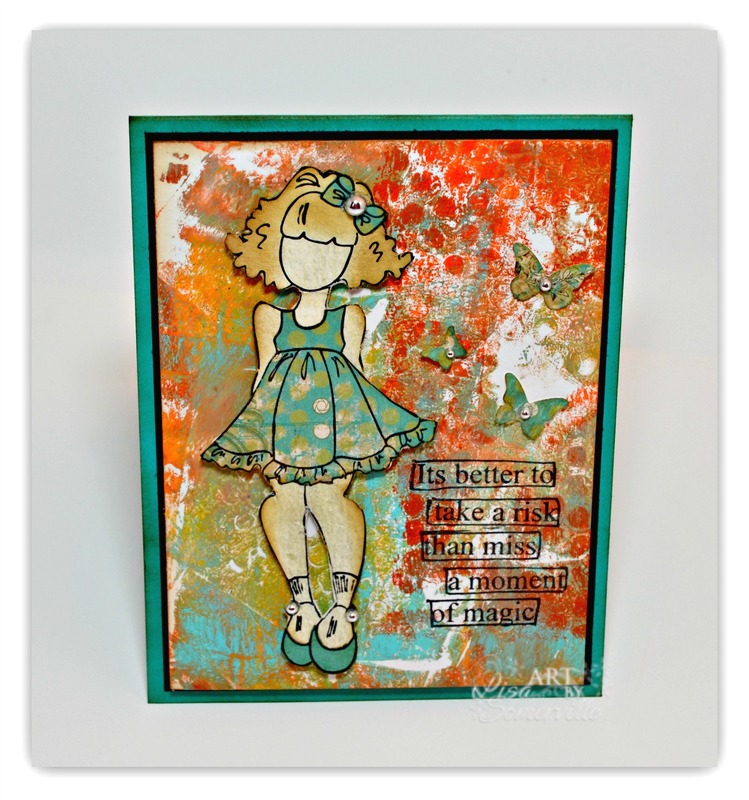 Love your mixed media background and the paper pieced element on the doll image. what a great background you created for your sweet Prima girl, Lisa! Wonderful bright colors! thanks for playing along with the ePlay challenge! Love this. Found it by way of SCS and had to come over to read more about it. Your gelli plate bg is awesome. Fantastic mixed media card Lisa! Thanks so much for joining along with the Simon Says Stamp Monday Challenge! Ain't she sweet! See her walkin' down the street! that's the song that comes to miind looking at this beauty! Love it! Wow, you are up to 30 players this week, what fun! Your card is gorgeous!!! Love the look of the mixed media... the image is fantastic!! Love it!! Wow!! Thanks for another fun challenge! Totally LUV your mixed media piece and especially that stamped lady :-) Thank you for this Challenge. LOVE your Gorgeous BG, Lisa with that Pretty Prima girl and butterflies! 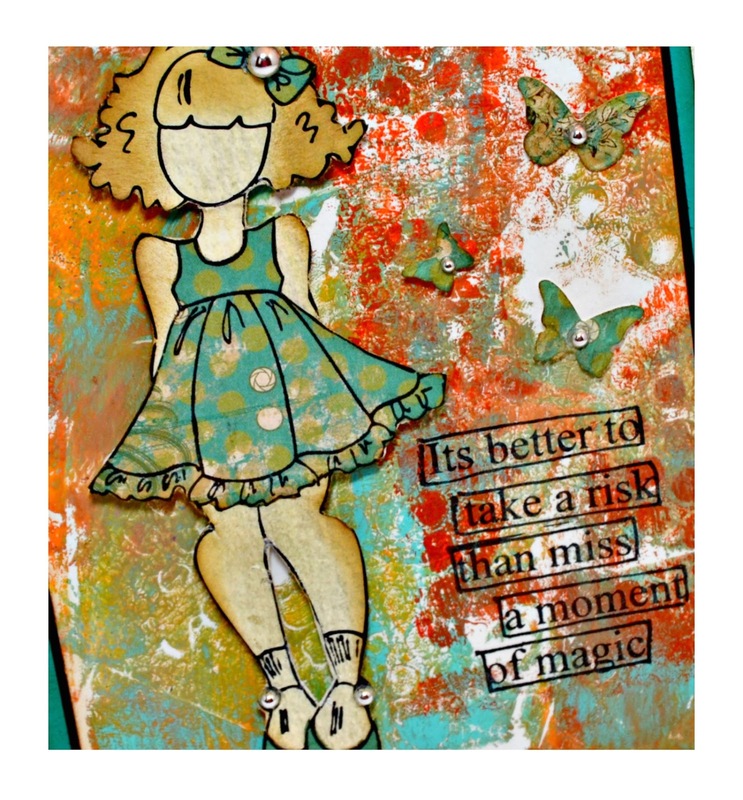 THX for playing with us in the eclectic Paperie ePlay Stencil Challenge! What an awesome card!!! The background is VERY cool! LOVE the Prima girl!!! My fav! Thanks again for playing another round in the ePlay stencil challenge!!! !